It's RSNA time again, which means, like many of you, the RT team will be trekking to Chicago in a few weeks to see and hear about the latest advances in radiology … and enjoy authentic deep dish pizza. To whet your appetite for the big show, we're reporting on some technological advances that promise to improve not only patient care but also workflow, and we're including a special section in this issue to help you find your bearings when you get there. The articles represent a cross-section of innovative engineering, and innovation will no doubt be on full display in multiple forms at RSNA, but you can start with a few slices now. Unfortunately, unless you live in the Chicago area, you'll have to wait like the rest of us for the pizza. In our cover feature, Keith Loria provides an update on the increasing use of ultrasound to detect liver disease. Although liver cancer rates are declining, mortality from liver cancer is on the rise. Noninvasive tests that can detect liver disease earlier, or, better yet, detect risk factors for disease, could go a long way toward improving treatment. The experts with whom Loria spoke discussed some of the latest ultrasound capabilities and expressed the opinion that it will assume a more prominent role in liver imaging. A newer technology that is also expanding its footprint is 3D modeling. Kathy Hardy details the process of getting a 3D modeling lab off the ground. Although 3D labs represent an upfront expense, many in the field believe that they not only improve patient care in the present but will also pay for themselves in the long run, especially as value-based care becomes a more significant factor in reimbursement. On the research front, the hunt for safe, effective, inexpensive nongadolinium contrast agents is on. Although gadolinium has proven to be highly useful as an MRI contrast agent and is generally considered safe by the medical community, questions about its long-term effects and potentially serious side effects have grown louder in recent years. Beth W. Orenstein looks at some of the new research that aims to improve MRI contrast without the associated safety questions. Finally, Dan Harvey interviewed some ergonomics evangelists who are spreading the word about physical workflow. It's no secret that imaging volumes are still increasing and radiologists have to read more studies, faster than ever. Preventing repetitive strain injuries and burnout are growing concerns among the radiology community. Some are taking matters into their own hands to improve the quality of working conditions so radiologists can increase productivity without sacrificing their health. 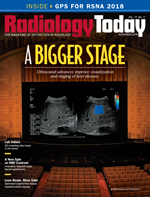 Enjoy the issue, and, if you happen to be at RSNA, stop by and visit us at booth 3252.